There are two versions of Thomas Robert Malthus's Essay on the Principle of Population. 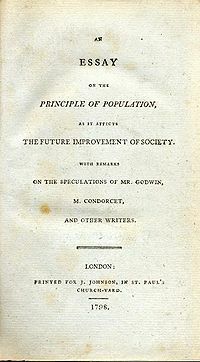 The first, published anonymously in 1798, was so successful that Malthus soon elaborated on it under his real name. * The rewrite, culminating in the sixth edition of 1826, was a scholarly expansion and generalization of the first.